This series is essentially a clone of the ASTM Precision Reference Standard series (ASTM 62 through 70), modified for those users whose equipment will not accommodate total immersion thermometers. 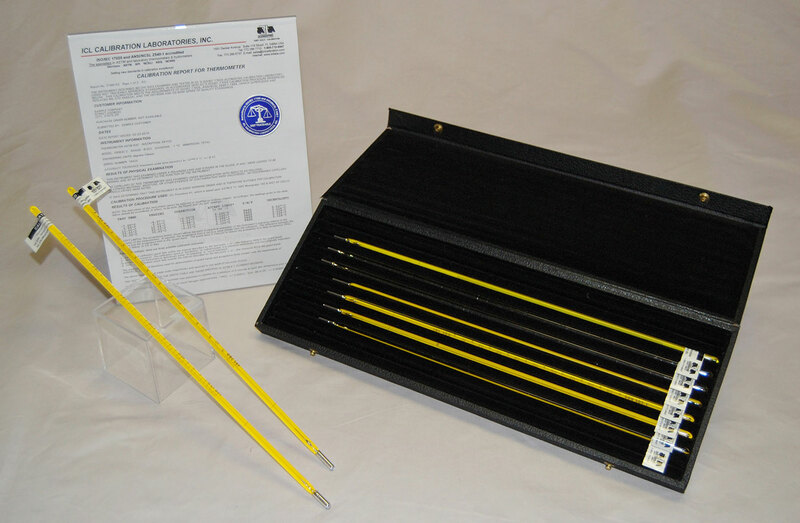 These thermometers are identical to the ASTM 62 through 70 thermometers except that they are calibrated for 100mm (4”) immersion and therefore do not carry an ASTM designation. Each of these thermometers is 15” (380mm) in length and calibrated for 100mm (4”) immersion. Each thermometer includes an ice point reference scale for easy verification, and is available with NIST Traceable certification at five temperatures across its range, including the ice point (0 °C or 32 °F). Available in complete sets or as individual units, these thermometers are a ‘must’ for laboratory verification programs where only shallow calibration baths are available. Set of 9 thermometers, Celsius or Fahrenheit, covering from -38 to 400 °C (or -36 to 760 °F), each with ICL’s ISO/IEC 17025 accredited, NIST traceable report of calibration. Thermometers in these sets are also available individually, as described in detail below. WARNING: Mercury is considered a hazardous material that can cause central nervous system, kidney and liver damage. Mercury, or its vapor, may be hazardous to health and corrosive to materials. Caution should be taken when handling mercury and mercury containing products. See the product Material Safety Data Sheet (MSDS) for details. User should be aware that selling mercury and mercury containing products into your state may be prohibited by state law.